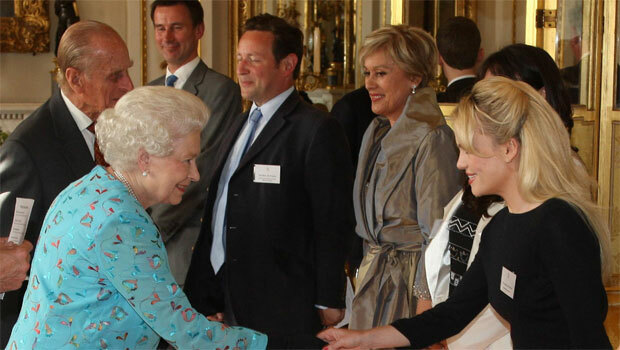 WELSH singing sensation Duffy was a special guest of the Queen as Buckingham Palace held its first event since the royal wedding. The Mercy singer joined fellow pop star Ellie Goulding and comedian Michael McIntyre in the palace’s White Room which last hosted the Duke and Duchess of Cambridge’s wedding reception. Duffy, whose real name is Aimee Ann Duffy, joined the Queen and the Duke of Edinburgh for a production of another celebrated love story, Romeo and Juliet. The palace’s 450 guests were treated to a modern interpretation of the Shakespeare work, told through street dance and rap performed by some of the UK’s hottest new acts. Monday night’s 30-minute show, directed by the English National Ballet, opened with Tchaikovsky’s Romeo and Juliet Fantasy Overture before the English National Ballet then followed with a piece to Prokofiev’s The Dance of the Knights. Grammy award-winning artist Duffy, from Nefyn, on the Llyn Peninsula, rose to fame following the success of her first album Rockferry. Last year she made her acting debut in the Marc Evans’ touching drama, Patagonia, which was inspired by the 19th century exodus of Welsh farmers and miners from poverty in England to new hope in Argentina. Despite receiving mixed reviews for her second studio album, Endlessly, the 26-year-old has seen her stock continue to rise. Only recently was she invited to 10 Downing Street for the launch of Save the Children’s No Child Born to Die initiative. Yet in a Western Mail interview earlier this year, Duffy insisted that despite travelling the world and meeting famous people, she was still the “same girl” who grew up in the small seaside village of Nefyn, with her twin sister Katy and older sister Kelly. “I guess my life is a lot more glamorous than it used to be in terms of the things I wear, the places I go, the places I stay, the places I eat at and the people I meet,” she said. Duffy and Mike Phillips Officially "Over"
Duffy and Mike Phillips splitting?